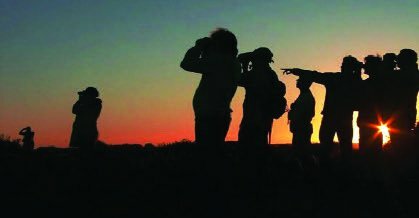 BirdLife South Africa’s 33rd Birding Big Day (BBD) is on Saturday 25 November and conservancies throughout the Bronberg area are taking part. All bird species seen or heard during a 24-hour period from midnight on Friday 24 November to midnight on Saturday 25 November will be recorded. The maximum area that can be visited is an area within a radius of 50 km. Only free-flying birds may be recorded; no caged birds. Last year more than a thousand birders recorded 654 species and also raised valuable funds for bird conservation. Funds raised will be shared between BirdLasser, and the Important Bird and Biodiversity Areas and Terrestrial Bird Conservation Programmes. For the first time BirdLife has added a fund raising competition. Teams are allowed to source sponsorships before, during and after the event. The team that raises the most funding on average per member will win two nights for four guests on a walking trail at Pafuri Trails Camp, including accommodation, all meals and walks each day.